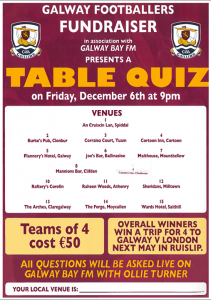 Galway Football in association with Galway Bay FM present a Supe Table Quiz on Friday 6th December at fifteen venues throughout the county and live on Galway Bay FM. 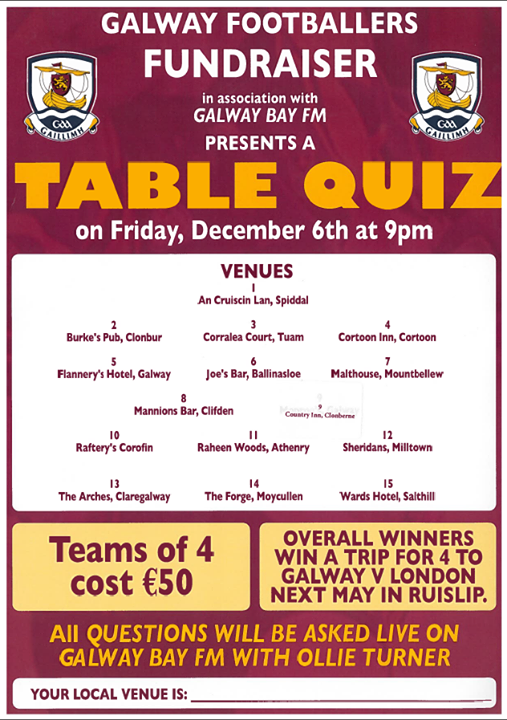 Teams of 4 cost €50 and the overall winners win a trip for 4 to the Galway V London Connacht Championship game in Ruislip. The Quiz starts at 9.00 p.m live on Galwaybay Fm with a first prize of a Trip for 4 to London for Galway’s championship opener against London in next years championship. There is also a prize at each venue for the winning table plus a raffle for other prizes.